It never fails, there is always someone that tells me that they don’t like Kale when I start talking about kale chips. Scary, a dark green leafy vegetable, what good could it be for? 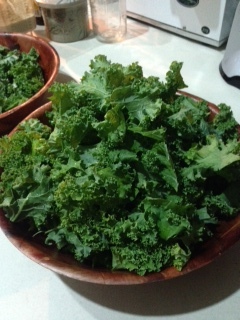 Well I love kale, as chips, in a salad or just adding it as greens. It helps to know how to prepare it, therein lies the key. I remember reading in a food book that grocery manufacturers know that they could feed you basically any kind of crap, as long as it is covered in a great sauce! Think of microwave dinners, cardboard in a box. The sauce is what the taste buds crave, not the piece of supposedly meat that’s in it. I tried this theory on our 11 year old, and yes, as long as I smother whatever veggie in a good sauce, he eats cauliflower, broccoli, cabbage, you name it. Kale chips are no different, its what you cover them with! Here is one of my all time favorite ways to prepare them, sure to get all the nay-sayers eating kale in no time. 1. Wash the kale and cut out the stems, tear the kale into bite size pieces. 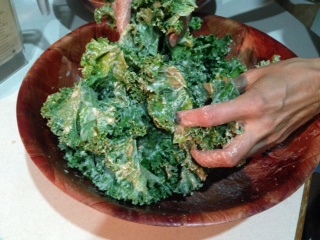 If the kale is super crisp, massage sea salt over it, let it sit for 10 minutes and then rinse the salt of, the kale will start to soften. 2. Place all the above ingredients (except the kale!) in a blender (K-tec or Vitamix) and run on high until you have a thick gravy like consistency sauce. Add water if its to thick or cashews if its to thin. 3. 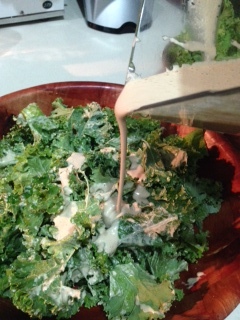 Place torn pieces of kale in a bowl, cover with the kale sauce 🙂 Massage the sauce into the kale, so every piece is covered all around. 4. Spread the kale on teflex sheets and place them in the dehydratorat 110 degrees for about 6 hrs, then flip them over onto a mesh sheet and dehydrate for another 6hrs. Make sure to check on it once in a while as they may get done earlier, or could take longer depending on how much sauce you put on them etc. If you don’t have a dehydrator, put them on a baking sheet into the oven and put the oven on the lowest setting. You could keep the oven door cracked open a little. I am not sure for how long you will have to bake the kale, it will vary based on the temperature. 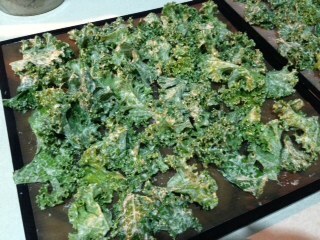 Basically, check the kale and remove it from the oven when it is nice an crispy. It needs to have that crunch factor! 5. For this particular batch I also added a healthy dash of chipotle seasoning to the sauce, you could add any spice you like, garlic, cayenne, etc to make it your own. Once the kale is all done place it in an airtight container. It does not need to be refrigerated and will keep if stored properly for a week or longer. 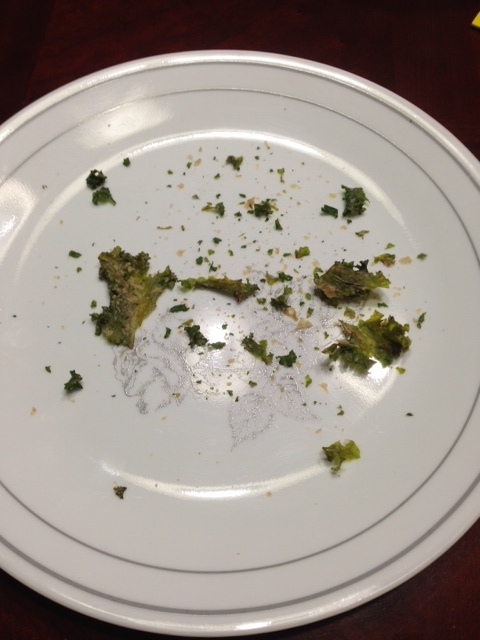 Make sure to hide the kale chips so nobody finds them or…. If you don’t like kale, try eating it this way! This makes a great all-healthy snack when you get the munchies, it satisfies that crunch factor and you don’t have to feel guilty about it! Previous Post How to keep your produce fresh! How is it that I’m just finding this awesome recipe?! We’re making these tomorrow!